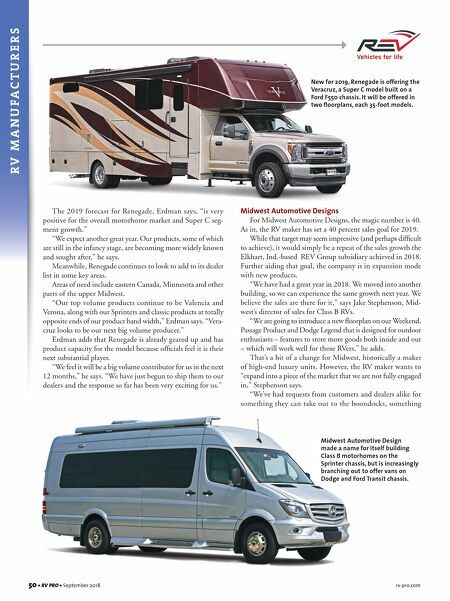 50 • RV PRO • September 2018 rv-pro.com R V M A N U F A C T U R E R S The 2019 forecast for Renegade, Erdman says, "is very positive for the overall motorhome market and Super C seg- ment growth." "We expect another great year. Our products, some of which are still in the infancy stage, are becoming more widely known and sought after," he says. 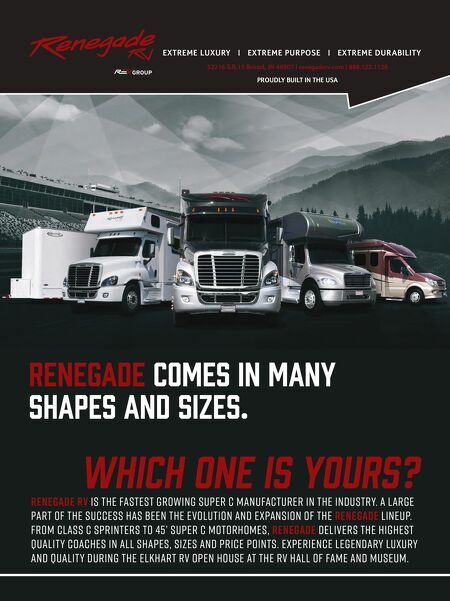 Meanwhile, Renegade continues to look to add to its dealer list in some key areas. Areas of need include eastern Canada, Minnesota and other parts of the upper Midwest. "Our top volume products continue to be Valencia and Verona, along with our Sprinters and classic products at totally opposite ends of our product band width," Erdman says. "Vera- cruz looks to be our next big volume producer." Erdman adds that Renegade is already geared up and has product capacity for the model because officials feel it is their next substantial player. "We feel it will be a big volume contributor for us in the next 12 months," he says. "We have just begun to ship them to our dealers and the response so far has been very exciting for us." Midwest Automotive Designs For Midwest Automotive Designs, the magic number is 40. As in, the RV maker has set a 40 percent sales goal for 2019. While that target may seem impressive (and perhaps difficult to achieve), it would simply be a repeat of the sales growth the Elkhart, Ind.-based REV Group subsidiary achieved in 2018. Further aiding that goal, the company is in expansion mode with new products. "We have had a great year in 2018. We moved into another building, so we can experience the same growth next year. We believe the sales are there for it," says Jake Stephenson, Mid- west's director of sales for Class B RVs. "We are going to introduce a new floorplan on our Weekend, Passage Product and Dodge Legend that is designed for outdoor enthusiasts – features to store more goods both inside and out – which will work well for those RVers," he adds. That's a bit of a change for Midwest, historically a maker of high-end luxury units. However, the RV maker wants to "expand into a piece of the market that we are not fully engaged in," Stephenson says. "We've had requests from customers and dealers alike for something they can take out to the boondocks, something New for 2019, Renegade is offering the Veracruz, a Super C model built on a Ford F550 chassis. It will be offered in two floorplans, each 35-foot models. Midwest Automotive Design made a name for itself building Class B motorhomes on the Sprinter chassis, but is increasingly branching out to offer vans on Dodge and Ford Transit chassis.